Paris offers iconic architecture, glorious food, stylish shopping, artistic treasures and a vivid nightlife for you to explore. No matter if this is your first time in the city of light, or you are a returning visitor, you will always find amazing opportunities to fill in your travel schedule with unique experiences. In this itinerary, we have put together the best of Paris in 5 days. It will guide you on which hotel to stay, so as to have easy access to all the suggestions of the itinerary, it will give you information on the restaurants you should eat, on the prices, on how to move around Paris and on the bars and clubs you should visit in the night. This itinerary has only one and perfect suggestion for each hour of the day so that you don’t get lost in looking for information. You just follow the travel itinerary plan and you will enjoy the best 5 days of your life in Paris. 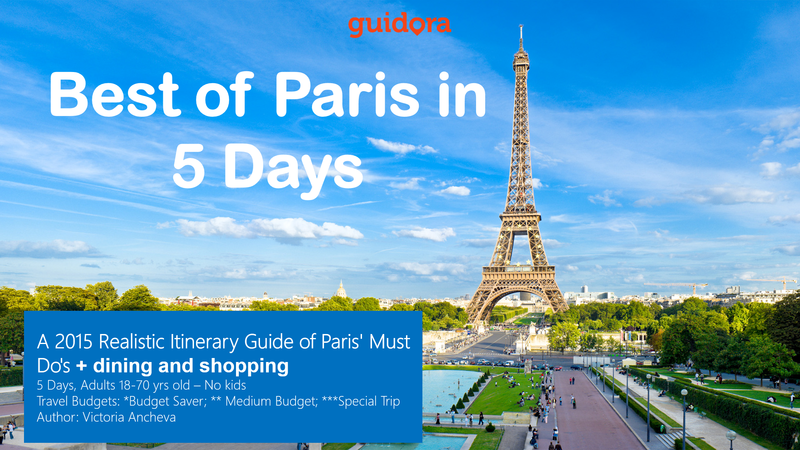 It will help you save time, save money and eliminate the stress from organizing your trip to Paris. – What is the best area to stay in Paris, especially if you are visiting it for the first time? – What is the best hotel to stay there, so as not to break the bank? – How to move in Paris, so as to avoid expensive taxis. – Things to do in Paris, what to see, how much it costs and tips on avoiding the lines. – Where to eat. Most recommended restaurants that will fit your schedule and your budget. – A detailed hour-by-hour plan for each one of the 5 days you will spend in Paris. Still wondering whether you should visit Paris? Have a look at this Expedia video below to get a glimpse of Paris! If you are looking for inspiration, you can read our blog on 10 best things to do in Paris, here. Sounds good? Get our detailed travel itinerary for Paris now by clicking below! I would love to go to Paris, I like to know what you can tell me about the the best time to go. Where to stay close to everything. Don’t really want to take the Merto. I want to be able to walk to all the places. Linda, the best time would be from May to October. The hotels in this guide have been specifically selected to fit all the locations of the program. Hope this helps.